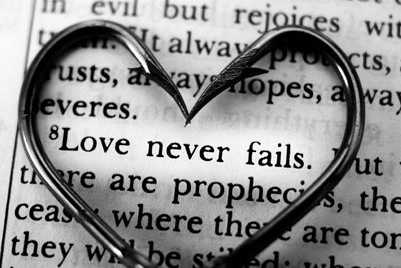 1 Corinthians 13 is a well-known chapter in the Bible. It’s is Paul’s famous chapter on the nature of love and is seen as the highest bench mark for Christians. He tells us in verses 1-3 how that even if we appear to have everything going for us by all external measures and it looks as though we are doing everything right, but don’t have love as a motivational force, then what we are doing is empty, useless and bears no fruit whatsoever. As far as God is concerned we might as well not bother at all than do all the right things for the wrong reasons! Sounds like love is pretty important then. Then, however, Paul gives us a big long list of what love is and what love is not and the standard we are expected to live up to. I always found this list really daunting – particularly in the Amplified version. It endures everything without weakening. It takes no account of the evil done to it and pays no attention to a suffered wrong. It sounds so great, but at the same time is an overwhelming list because we are always looking at how much we don’t measure up to this perfect standard. However, there is another way of looking at it. Any of these attributes can be said to describe a loving person, so if we do any of them, then we are doing it from a motive of love. So if we choose to overlook an offence, or we don’t get annoyed at someone even though we have an opportunity to we are walking in love. When someone appears to wrong us, but we choose to believe they didn’t mean to hurt us, or we decide not to give up on someone who has let us down repeatedly then we are walking in love. God knows our weaknesses and although this chapter shows us the gold standard, this doesn’t say that we have to do it all or we have failed. At the point in which we do ANY of it, then we are obeying God’s command to love one another.